The Mad Tea Party ride in Magic Kingdom’s Fantasyland seems to be one of those “overlooked” DisneyWorld rides. If you are like our family and think about attraction rides at DisneyWorld, you would probably think of the most popular rides like Space Mountain, Big Thunder Mountain Railroad, and Peter Pan just to name a few. Carson and Courtney aren’t tall enough to go on those big rides, so the Mad Tea Party seems to fit the bill for a ride meant for the entire family. 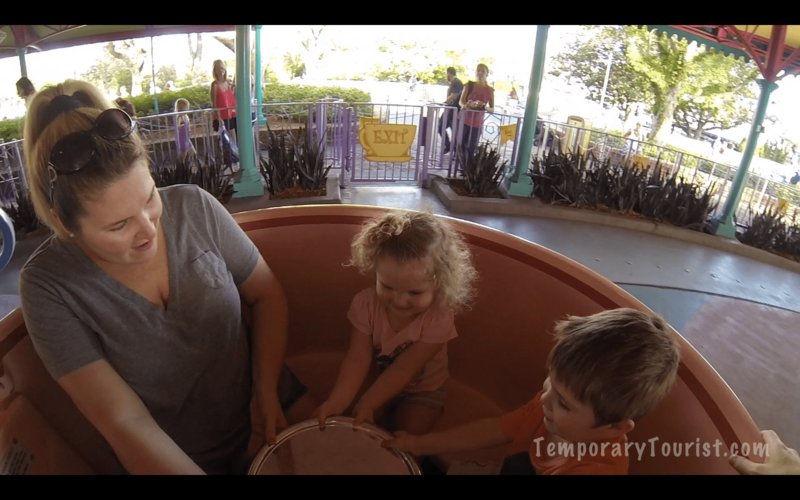 We’ve found the Mad Tea Party ride to have relatively short wait times, even on busy days. The location of the ride is east of Cinderella’s Castle near the Tomorrowland Speedway, so it’s a good ride to use for the family of you’re waiting for any attraction rides in Tomorrowland and in the new Fantasyland, namely rides such as The Many Adventures of Winnie the Pooh or Under the Sea – Journey of The Little Mermaid. The Mad Tea Party ride itself is good for the entire family. It’s a spinning ride where you sit in a tea cup and spin in a circle for the duration of the ride. There’s a silver wheel in the middle of the tea cup which enables you to turn the tea cup to spin even faster for more intense ride. Here’s a video of our family ride the Mad Tea Party ride at DisneyWorld Magic Kingdom from February 2014. I think you’ll see it’s a great ride for families of all ages! I shot this video with the GoPro Hero 3 Black Edition mounted with a GoPro head strap. Yes, I looked a bit weird but I think I got a great video!